The session of the now popular Truckee Tahoe Flight Plan was a major success! 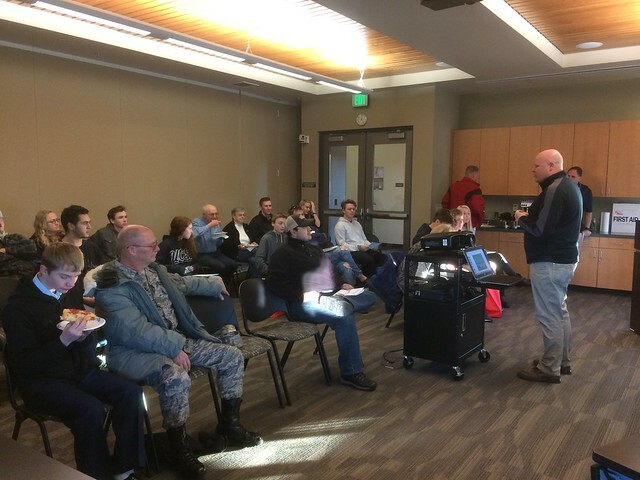 Twelve students, parents, and aviation executives assembled at the Truckee Tahoe Airport to discuss aviation careers and what employers and college recruiters seek from today's high school and college students. The evening was highlight by presentations made by three outstanding aviation leaders. Kevin Smith. Truckee Tahoe Airport's General Manager started the evening off by welcoming everyone to the Airport, which has become home to our career workshops. He was followed by Blake Sorter, a local 22 year old pilot for Surf Air, Karin Hardiman, Tower Manager for Truckee Tahoe Airport, and James Bonner, Assistant Campus Director for Embry-Riddle Aeronautical University. Following the presentations, Eric Henry and Pete Parker guided the students through the identification of hard and soft skills to illustrate what employers seek in new hires. The conversation morphed to resume writing tips, as most of the students had not crafted resumes of their own. To date, the students have participated in two workshops focusing on job searching, skills identification, and resume writing. They will return on March 15 to learn about first impressions, personal branding, and networking. The session will feature another set of outstanding presenters, then engage students in a very interactive career planning conversation. Click below to view photos from our second session. Join us on Thursday, March 15 from 5:00pm to 7:00pm at the Truckee Tahoe Airport. Click here for details and to RSVP.